Multimodal chemical imaging using laser-assisted atom probe tomography directly correlated with aberration-corrected scanning transmission electron microscopy of a model catalyst material: gold nanoparticles (yellow) embedded in magnesium oxide (purple), reveals that nanoparticle composition is most accurately predicted when the magnesium oxide is treated as having a locally variable evaporation field in addition to accounting for the difference in evaporation rate of the gold and magnesium oxide during APT analysis. Copyright 2014: American Chemical Society Enlarge Image. Results: On the surface of a battery's electrode, a material that stores wind energy, or on nearly any other surface, scientists can use atom probe tomography to identify and locate almost every atom. But some atoms evaporate non-uniformly before they are identified -- reminiscent of the angels' share, the amount of wine or whiskey volume lost to evaporation during barrel aging. Scientists at Pacific Northwest National Laboratory (PNNL) and the University of Rouen revealed which atoms evaporate in mixed materials, where there are many different types of atoms. They managed this feat by correlating data from three techniques, accounting for all of the atoms and determining how atoms were evaporating from APT. "Such studies are needed to push the boundaries of state-of-the-art chemical imaging tools to new horizons where true atomic-scale images of energy and environmental materials can be achieved," said Dr. Wayne Hess, who coordinates such research within PNNL's Chemical Imaging Initiative, which funded the research. Why It Matters: Longer lasting batteries. Better catalysts. These and a number of innovations could greatly benefit from knowing the distribution of atoms in three dimensions. To achieve this information, the limits of atom probes and other existing characterization capabilities need to be investigated, understood, and improved. "There is an immense need to understand the three-dimensional elemental distribution of materials at truly atomic resolution," said Dr. Arun Devaraj, a PNNL materials scientist and lead author on the study. "This need stems from the direct dependence of the performance of energy materials on the atomic scale -- both the structure and distribution of elements." Methods: The team began with a metal-dielectric composite that consisted of gold nanoparticles set in a magnesium oxide surface. 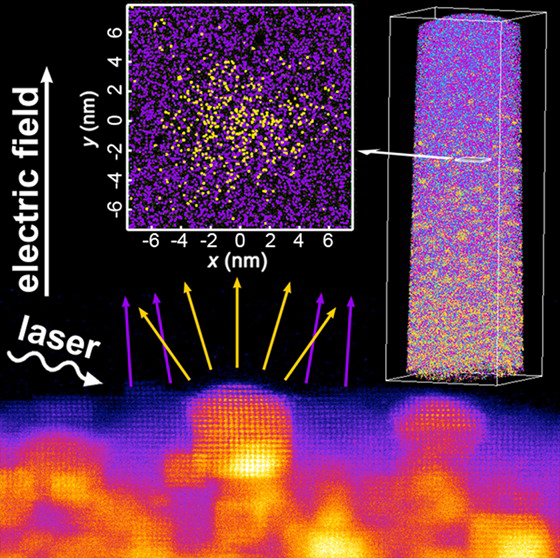 Working in EMSL, they examined the surface of this model catalyst with a high-resolution scanning transmission electron microscope before and after atom probe analysis. Dr. Francois Vurpillot, a collaborator from University of Rouen, France, then examined the evaporation behavior using finite element simulations. They found that the difference in evaporation between the gold surfaces and the magnesium oxide surfaces can lead to unequal evaporation rates in the two regions. "Ours is the first detailed experimental observation of atomic-scale topographical variations during atom probe tomography analysis of heterogeneous materials," said Dr. Theva Thevuthasan, a senior scientist at PNNL who worked on the study. "Our results can help create strategies to understand and correct aberrations in atom probe reconstructions, paving the way to more accurate and reliable analysis." What's Next? The team is extending their work on the model catalyst toward analyzing more practical, industrially relevant energy and environmental materials using APT analysis as well as correlative microscopy and computational simulations. For example, they are examining advanced lithium- and sodium-ion battery electrodes, designer catalysts, and atmospheric mineral dust aerosols. Sponsors: This work was supported by the Chemical Imaging Initiative at Pacific Northwest National Laboratory, which is funded by the Laboratory Directed Research and Development (LDRD) Office. The research was performed using EMSL, a DOE Office of Science User Facility sponsored by the Office of Biological and Environmental Research and located at Pacific Northwest National Laboratory, and with the assistance of the William R. Wiley postdoctoral fellowship. Atom probe tomography or APT is a microscopy technique that provides precise, three-dimensional information about what kind of atom is sitting at a specific position. However, the technique still has challenges to be overcome before it can help scientists achieve the dream of truly atomic-scale information on energy and environmental materials, such as new catalysts and cathodes. This is where correlating with the results from the aberration-corrected scanning transmission electron microscopy, shorthanded STEM, at EMSL comes to rescue. Complementary information from the two-dimensional imaging of STEM helps answer questions in combination with APT.